What Makes The Caribou Future Farmers of America Program So Unique? 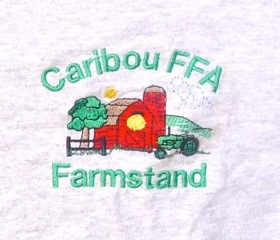 The Caribou Future Farmers of America program is based at the Caribou Regional Technology Center. 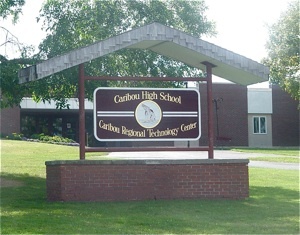 This Center is attached to the Caribou High School, but it operates as a separate entity and offers Ag Mechanics and Engineering, Horticulture, Agriculture and Natural Resources classes. Thomas Hale, the Agriculture and Natural Resources teacher at the Caribou Regional Technology Center, has been a major factor in the success of the Caribou Future Farmers of America program. has owned his own sixty-five acre farm in Aroostook County where he operated a cut-and-choose Christmas tree farm with 5,000 trees since 1978. 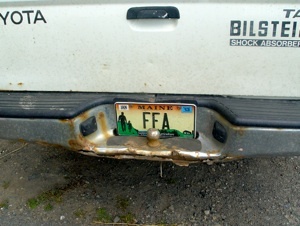 When a discussion of Aroostook County takes place, several images often come to mind. It’s affectionately labeled "The County" and people often mention its remote location, extended period of cold weather, friendly and hard-working people, rich cultural traditions, and beautiful landscapes. 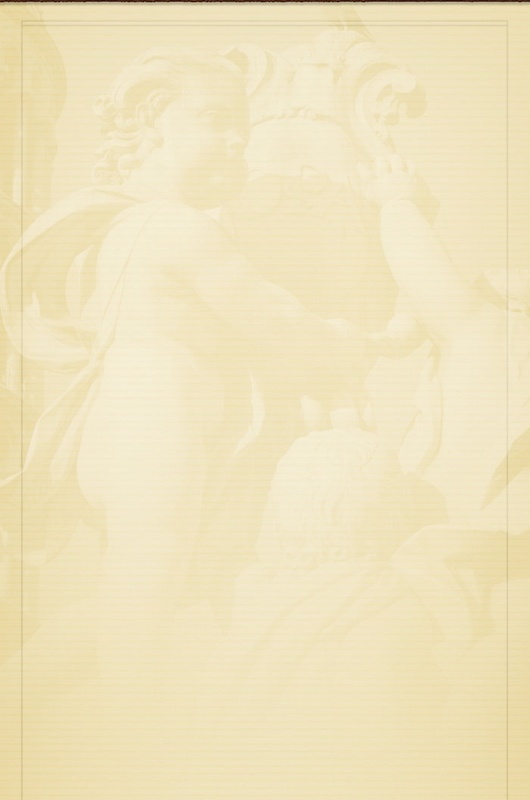 There is also almost always a reference to the area's rich history of growing potatoes. Potato production in Aroostook County has waned considerably due to several factors including low prices for potatoes, the shift away from fresh potatoes towards frozen potato products, a highly successful marketing of the Idaho potato, and the competition from subsidized potato farms in other parts of the country. The time when all schools in Aroostook County closed for the potato harvest and every single school-age child worked on a potato farm during that school break no longer exists. Students in high school and technology centers still have a two-week harvest break. According to Mr. Hale, approximately 23 percent of students work directly in the potato harvest. Labor laws prohibit the operation of a tractor by young people under sixteen years of age and prohibit certain other potentially hazardous agricultural jobs being done by youngsters. The Caribou Regional Technology Center is situated in a community where farming is still highly valued. The town of Caribou chartered the first chapter of what was known as the Future Farmers of America in Maine in 1930, and the organization is still going strong after eighty-two years. Thomas Hale commended the Advisory Committee of the Caribou Future Farmers of America which is composed of local business men and women. The Caribou Chapter of the Future Farmers of America has regularly sent students to compete in the state Future Farmers of America Convention and at the Big E in Springfield, Massachusetts. 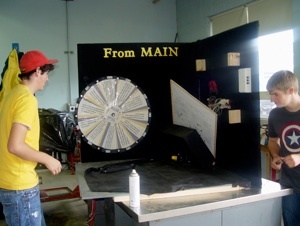 On the day when this profile took place, students were disassembling their “From Maine to the World” interactive project which had won second place at the Northern Maine Fair in Presque Isle, Maine. The students were preparing for the National Convention. One of the students had also won a state proficiency award for his project raising chickens. The Agriculture Education Advisory Committee of the Caribou Future Farmers of America has been very supportive of the construction of a greensprouting or “chitting” research facility on the grounds of the Caribou Regional Technology Center. Research is being conducted on planting sprouts earlier with a two-week advantage so that early market potatoes will be available. The students in the Caribou Future Farmers of America run a 12x12 farmstand on Sweden Street outside the school where they sell farm produce and plants. Neighbor Carl Soderberg graciously allows the students to farm some of his land. The students have learned about crop rotation as they have planted cover crops such as rye on this land. Mr. Hale teaches Horticulture and Ag Mechanics in the morning and Agriculture and Natural Resources in the afternoon. 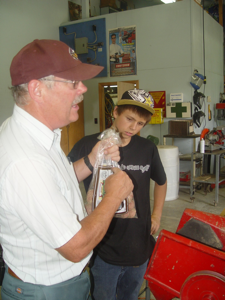 At the end of August, students were getting firsthand experience of potato harvesting and the steps that take place in weighing, sorting, and bagging the potatoes. The students who had successfully completed the twenty-two-hour safety equipment course were able to hook up the potato harvester to the tractor and drive it to the potato field. Eleven different varieties of potatoes were planted by the students. 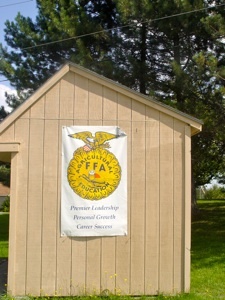 A former student of the FFA program contributed the seeds for this past year’s planting. Hale explained that early potatoes were grown so that the students’ potatoes would be the first on and the first off the market. By being the first on the market, the students were able to garner higher prices. potatoes that the students harvested were sold at the farmstand that the students operate, and the remainder were donated to the local food pantries. County many former potato fields are now filled with broccoli. Thanks to Thomas Hale, the students at Caribou Regional Technology Center are fully aware of all that goes into a successful potato harvest and they have chosen to stay with the traditional crop for which their county is renown. 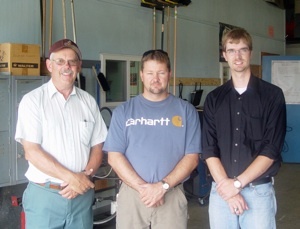 From left: Tom Hale, FFA AG Mechanics Coach Keith Dumond, and FFA Jr. Advisor and Graphic Arts Instructor Darick Williams. 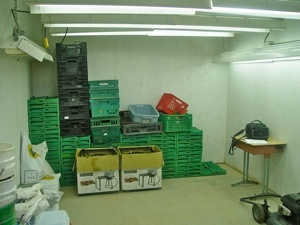 The interior of greensprouting or “chitting” research building is pictured. 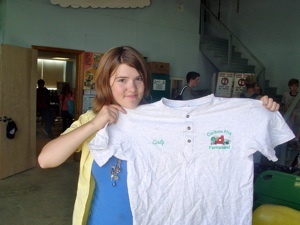 Cindy shows the Caribou FFA Farmstand shirt. Note the most appropriate license plate for Tom Hale’s vehicle! The Farmstand run by the Caribou Future Farmers of America. 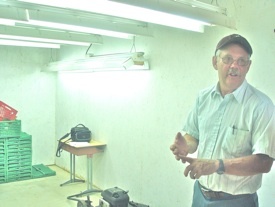 Tom Hale is the Advisor of the Caribou Future Farmers of America program. Mr. Hale explains the work being conducted in the greensprouting or “chitting” research building. This interactive Caribou Future Farmers of America project, “From Maine to the World,” won second place at the Northern Maine Fair in Presque Isle, Maine.